Watermelon Cupcakes with Watermelon-Buttercream Frosting from The NY Melrose Family. Are you hungry..? You will be after you see these gorgeous cupcakes from Jenny at The NY Melrose Family. Summer is in full swing here at The NY Melrose Family and we love taking advantage of Summer fruits. One of my toddler’s favorite fruits is watermelon. She’d eat an entire watermelon if I let her. We are also HUGE cupcake fans. Her third birthday was a Cupcake Fairy Party. So clearly, we go a little overboard with the cupcakes. One of our favorite cupcakes that we’ve made was our Watermelon Cupcakes with watermelon buttercream icing and topped with chocolate chips for the pits! So cute and delicious. We are always cooking up some kind of cupcake and we’d love for you to stop by and join in! Be sure to check out our Blueberry Lemonade Cupcakes, which have been pinned over a thousand times! 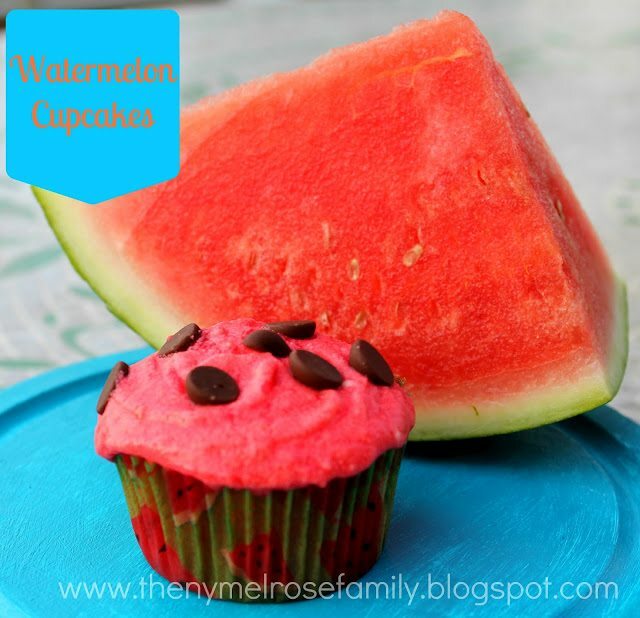 Swing on by to grab the fabulous recipe for our Watermelon Cupcakes and say hi. Watermelon Buttercream frosting?! I die. Yum! Thank you Jenny! I’m always looking for new recipes and fun flavors! I am definitely going to give these a try.